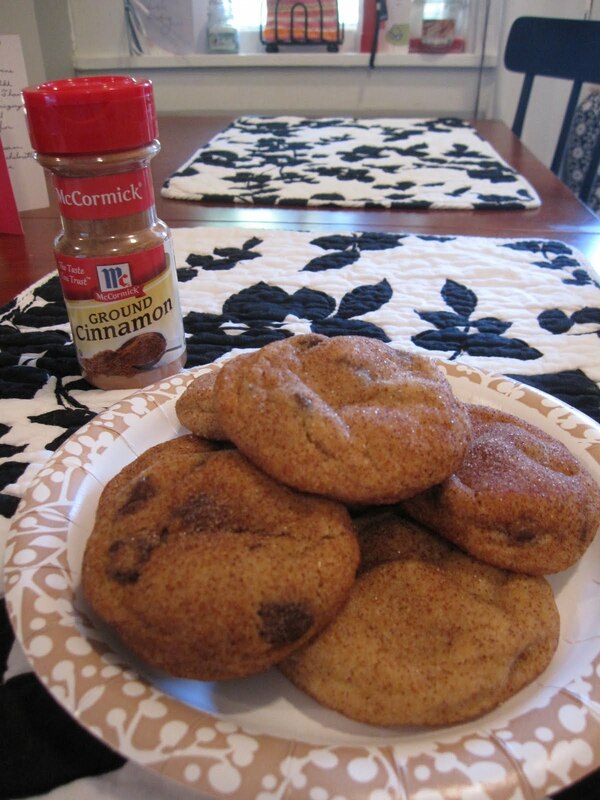 The Academic Chef: Chocolate Chip Snickerdoodles! With a summer work party on the horizon and a busy few days before, I knew I needed to make something that would last for a few days since I couldn't bake the night before. Cookies are great in this sort of situation because you can make the batter and freeze that, or you can even make the cookies and freeze them as soon as they cool - that way they're perfectly fresh when you bring them to your party a few days later! Rather than the traditional chocolate chip I was thinking that a cinnamon chocolate chip cookie would taste good and found the idea for this chocolate chip snickerdoodle! If I may say so myself, I think they came out great - lots of compliments from coworkers and they weren't too time consuming, which is always a plus. Like most cookie recipes I make, you start by mixing all of the dry ingredients together (flour, baking soda and powder, salt and cinnamon). Sadly I still don't have a stand mixer so I used my hand held mixer to beat the butter and sugars together first (until creamy). Then I added the egg and vanilla and beat together again. Then you can gradually add your dry ingredients, beating after each addition. Mix in the chocolate chips yourself by hand so that the chips don't get broken up by the mixer. That's it - the batter is done! If you have the time, chill the batter for about 30 minutes to 1 hour. I didn't have the time though, and the cookies came out just fine without the chilling time. Roll the batter into small balls and then roll right into your cinnamon sugar mixture (which can be mixed together in a small bowl). Place them right on your baking sheet and bake at 350 degrees for just 8 minutes. Like I've said before, most people overbake their cookies which is why they come out more crispy. I like my cookies chewy and soft on the inside so I always take the cookies out when they're looking like they're not quite done because they'll continue cooking as they cool on the rack. As soon as mine cooled I put them right in the tupperware I was taking them to work in and threw them right in the freezer. I baked on Sunday night and our party was Thursday - worked out perfectly. This batch made about 2 dozen cookies. Enjoy! And thanks for the name idea Mary! Perfect Summer Salad with Chickpea Burgers!